Iceland is located in the North Europe. Iceland is a island between the Greenland Sea and the Northern Atlantic Ocean, northwest of the United Kingdom. The island covers a total of 103,000 sq km, about 100,250 sq km land and 2750 sq km water. The tempature is moderated by the North Atlantic Current. Iceland has usually cold windy winters, damp and cool summers. The Icelandic terrain is like no other, Iceland as many mountains, ice fields and the coast is deeply intended by bays and fiords. There are also some natural hazards in Iceland such as earthquakes and volcanoes. The most famous volcanic eruption happened some year before in the mountain Hekla. Iceland is populated by few, 293,577 which was last estimated 31. December 2004 . Every year the population grows for about 0,97 %. The Icelandic capital is Reykjavik and the population of Reykjavik and surrounding areas is more than 180,000. This island is the most sparsely populated country in Europe with an average about three inhabitants per square km. The public language is Icelandic. Also an interesting fact is that Reykjavik is the northernmost national capital in the world; more land covered by glaciers than in all of continental Europe. The state religions in Iceland is Evangelical Lutheran which holds over 85% of the population. Other denominations: Evangelical Lutheran Free churches (3.5%), Roman Catholic Church (1,1%), Pentecostal and Charismatic Congregations (1.0%) and others (1.2%). Non-affiliated amount to 2.0% of the population. Protestant 4.1%, Roman Catholic 1.7%, and other 8.1 %. 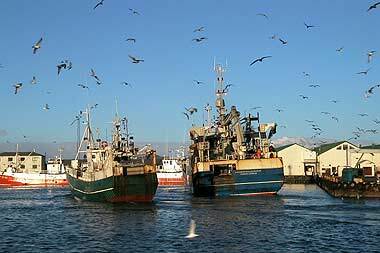 Fishing and fish processing is the main economic activity in Iceland, accounting for 50% of foreign currency revenues and about 11,8 % of the population work in the fishing industry. Iceland have also other industries such as aluminum smelting and a ferro silicon production. Other important employments in Iceland are agriculture, industry and services. The service sector has grown rapidly the last years and is still very much on an upward trend. Perpetually more tourist are visiting Iceland every year. Most of the tourists visit Iceland in the summer but the number of visitors in the wintertime is growing. In the year 2004 came 362.200 to the country, which his very high considering the population of the Iceland, which is only 290000. The currency which is used is the Icelandic krona (ISK). but there were two species found in Iceland upon it's settlement; mice and foxes. Domestic animals such as horses, cows, sheep, dogs, cats and hens came with the settlers to Iceland. Because of the isolation of the island the domestic animals have not changed much and the Icelandic horse is remains to be purebred. 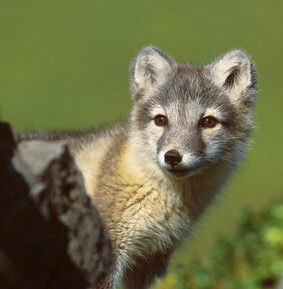 It is belived that the fox came to Iceland about 10.000 years ago, it came from a breed of foxes called the Arctic fox. The Arctic fox has an extremely thick and strong fur that is belived to withstand all up to 70° degrees frost in calm weather. This is a big factor in the Arctic foxes ability to survive in Iceland but still there are only about 3-4000 of them here. The fox has been hunted since the settlement mainly because of it's fur and his killing of life stock. Now one need to buy permit to hunt foxes. The Icelandic horse is a supreme breed of horses and Icelanders are proud of this fine breed. And what is it that's sets the Icelandic breed apart from other breeds is its intelligence and strength and it's ability to learn five different kinds of gait. For centuries this animal was Iceland's only form of transportion and played a huge part in the history of Iceland especially in heathen times providing strategic strength in warfare and such. And it is still used by native farmers for sheep gathering. The breeding of the Icelandic horse is gaining popularity in Germany and also in the USA and Canada. There are about 270 species of birds in Iceland, a lot of them migrate to Iceland from many countries in Europe and even from other continents like Africa and South-Amerika. The first migrant birds every year are seabirds which arrive usually in February. The next weeks many species take ashore. Some of the birds stay here all the year like the ptarmigan winch changes color in accordance with the changes of the seasons. Due to the climate changes many birds are coming to Iceland every year and some of them even lay eggs. 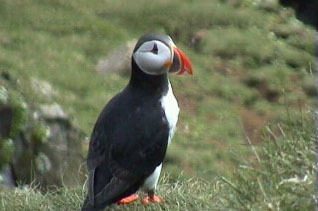 On of the most popular bird in Iceland is the puffin.